Troy Deeney is used to sending the Watford fans into raptures when he finds the back of the net. Not this weekend, though. 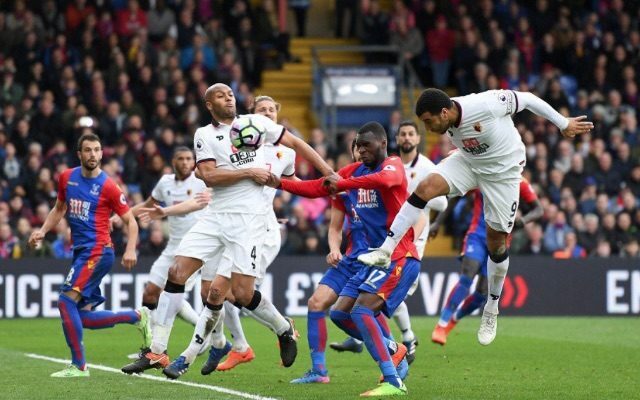 As he beat his man and headed home, it was the Crystal Palace fans celebrating, as the Watford captain found a way past Heurelho Gomes to score an own goal and hand Palace a 1-0 win. He isn’t the first striker to find the back of his own net though, as these five forwards can testify. We start with an effort from this season and who could forget Darren Bent’s gravity defying own goal in Derby’s FA Cup fourth round tie with Leicester. A Marc Albrighton corner deflected around the box before falling to Bent on the line. The former England striker took a wild swing with his left foot, mistimed his clearance and somehow managed to spoon the ball backwards with the outside of his boot, into his own net. It is hard to argue that any player on this list is more gifted at converting in the wrong net than Walters, who once netted two own goals in just one match against Chelsea. In a first-half to forget, Walters first sent a Cesar Azpilicueta cross flying past his own goalkeeper before rising to nod home a Juan Mata corner. Its fair to say that Alan Smith was never a prolific scorer but the goals he did score were usually memorable. His own goals were no different. In a match against Wolves, Smith tried to clear a low flying corner at the near post but fluffed his clearance, sending the ball spinning goalwards. The ball lobbed goalkeeper Paul Robinson and then Garry Kelly at the far post before hitting the upright and deflecting into the net. This was an early sign of United’s bad luck, as they were to be relegated at the end of the season and are still yet to return to the Premier League. In his time at Tottenham, Bale scored one of the most unfortunate own goals of all time. As Aaron Lennon attempted to clear a Steven Gerrard header off the line, he smashed his clearance straight into Bale’s face from point blank range causing the Welshman to inadvertently send the ball into his own net. Bale was left stricken on the deck, holding his face, but it didn’t prove too costly, as Spurs held on to win 2-1. Yes, you read correctly, the imperious Ronaldo did indeed once find the back of his own net. Back in February 2013 against Granada, he rose like the proverbial salmon to nod home a corner. Unforutantely for him, it was in the wrong net. Even more unfortunately, it was the only goal of the game and Madrid lost even more ground on Barcelona, who went on to win La Liga at a canter.